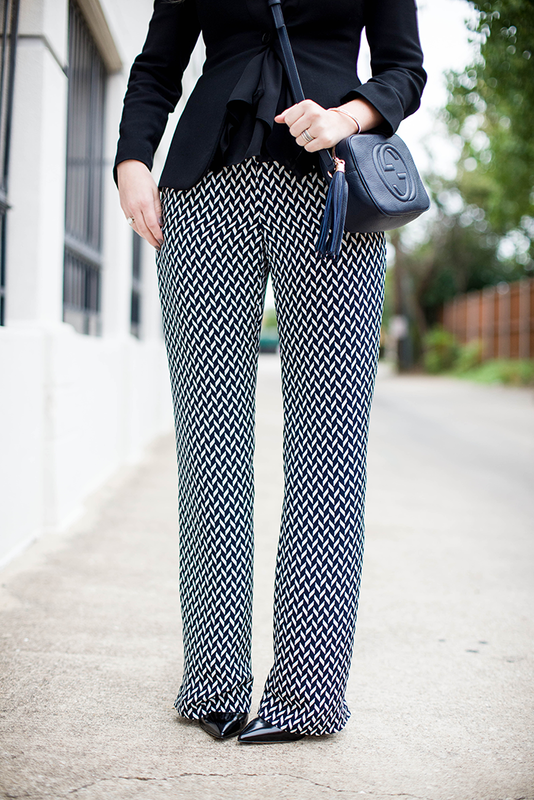 These printed pants have been a lifesaver through this up-and-down weather we’ve been having in Dallas. They’re warmer than a skirt in the cool mornings, but light in the warmer afternoons keeping me temperature-appropriate at all times. Did I mention how comfortable they are? 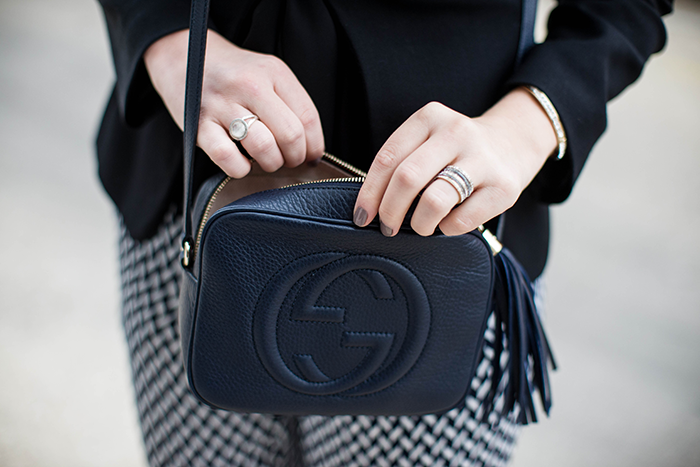 I’m eager to share a few accessories that have recently been added to the mix, courtesy of Gucci and The Dreslyn. I came home to this bag as a gift from the brand itself (a dream!!) and have been wearing it ever since like it’s attached to my body. The disco bag is the perfect crossbody style, in my favorite shade, and the cutest tassel to boot. 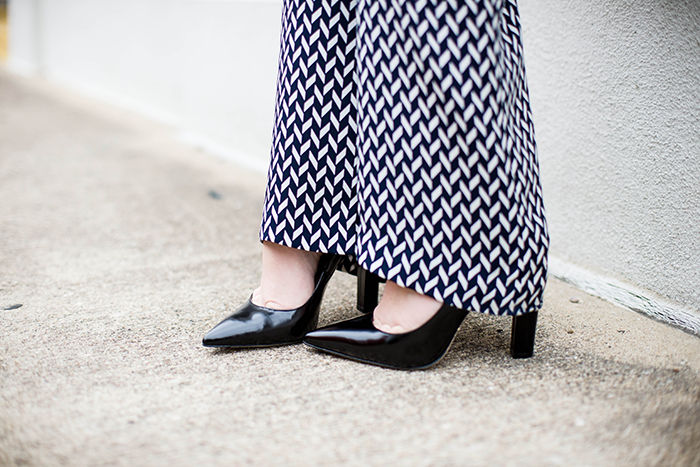 These Elizabeth & James pumps are a recent acquisition, thanks to a little gift from The Dreslyn – my new favorite online shopping destination. They’re a classic style and shade, but the thicker heel makes them super comfortable and wearable all day long. 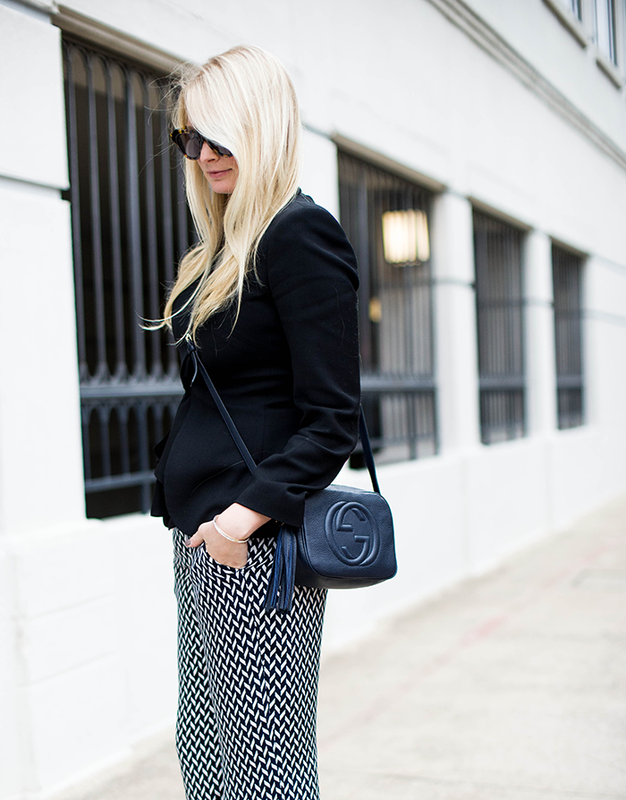 Love this classic look, the pants fit you so well and this Armani blazer is a dream. 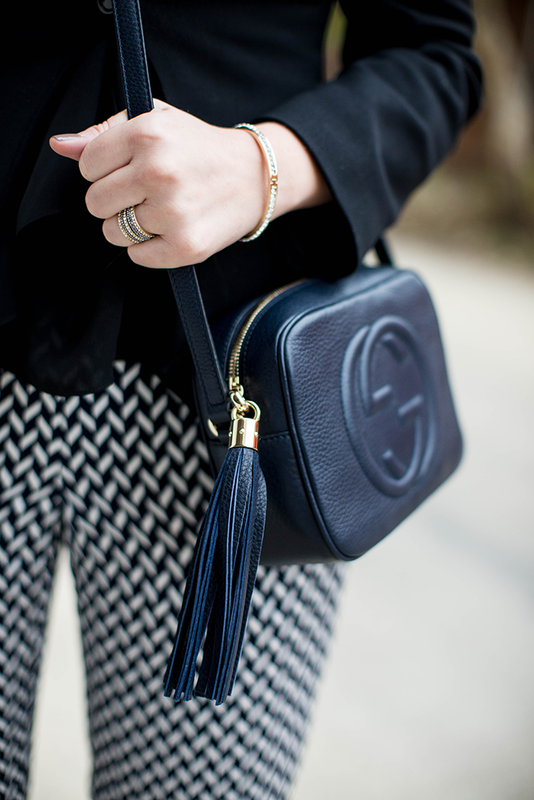 Such a classic bag, and these trousers look amazing on you! If I had these Theory pants, I would live in them! They look extremely comfortable! Those pants! Love the look. LOVE those pants, they are amazing! I love everything about this look. Those pants are fabulous. And I love the bag! And the shoes are gorgeous! Love love it! Im pretty much obsessed with those pants. The print is incredible. Love that you can wear those all year long. I’m totally obsessed with those pants. And I adore that your blazer ties, so sweet. Those pants are perfection! I love Theory !! Ooh, a bag from Gucci? Lucky girl! I love the pants, such an interesting pattern and fantastic fit. Those pants, amazing! Love the print and as you said, who doesn’t adore a pair of pants that compliment the weather changes throughout the day? This whole looks is fantastic! The pants are so fun and classy at the same time. Your hair looks so gorge, and I love that Gucci crossbody bag! I love the bag of gucci!!! so cool this oufit!! 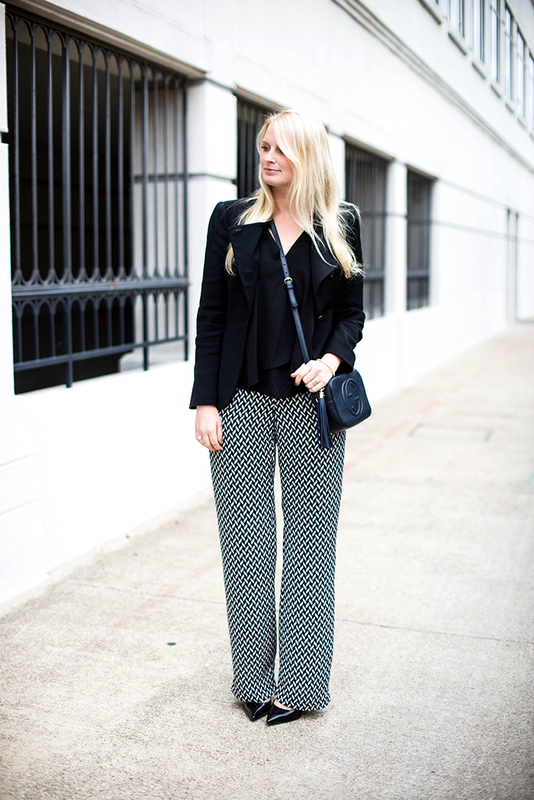 Love those pants and that gorgeous bag! Great style! 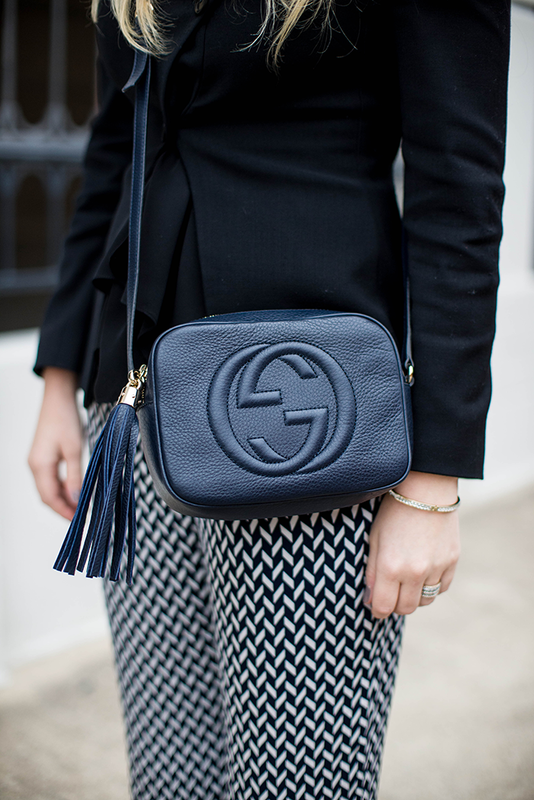 That Gucci bag is a classic – love the tassel!